Manatee Springs State Park is home to one of Florida’s largest freshwater springs. A popular summer recreation site, Manatee Springs is an important winter refuge for West Indian manatees. From November through April, these gentle giants are regular visitors to the spring and a favorite attraction for park visitors. The north end trail system has 8.5 miles of trails for walking or bicycling. The spring is ideal for swimming and SCUBA diving, especially during the warm weather months. The spring run and Suwannee River are well suited for canoeing or kayaking. Rental canoes are available at the park concession, which is open seasonally. Boat ramps are located just outside the park. A Florida freshwater fishing license may be required. The park’s 86 campsites are equipped with picnic tables, grills, water and electricity. Hot showers and restrooms are also available. A campground for non-profit youth groups is available for tent camping (some restrictions and fees apply, contact the park for information.) Pavilions located in the picnic area may be reserved for group gatherings. 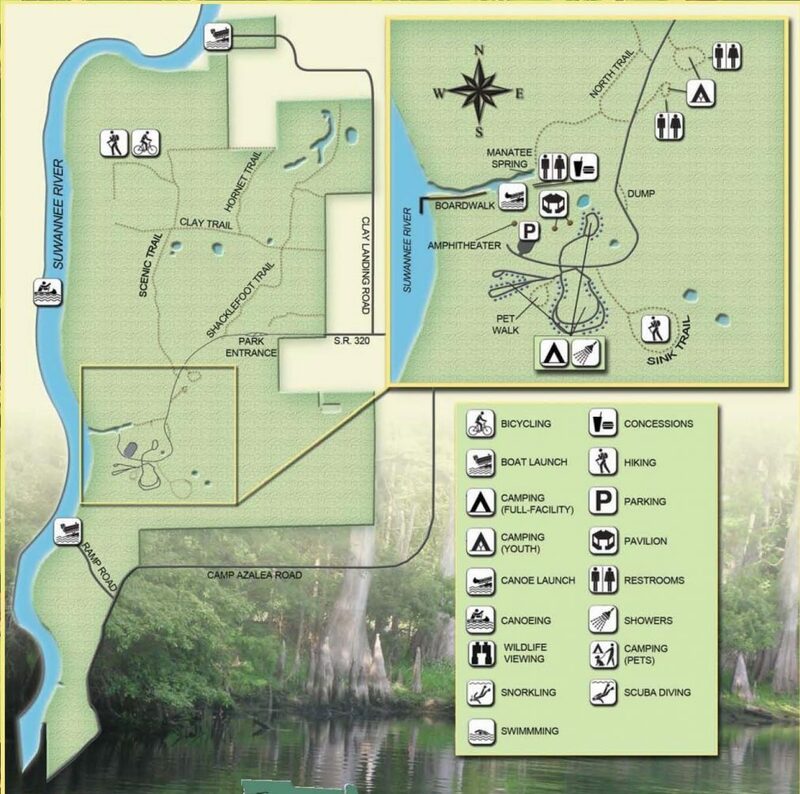 Seasonal interpretive programs and activities are offered on a variety of topics.The following map and trail guide is provided courtesy of the Florida Department of Environmental Protection, Florida State Parks.